The AFQT Test: What is it, How is it Administered, and How is it Scored? Anyone who is planning to enlist in the United States Armed Forces should be familiar with the military’s standards and screening processes. An important part of this screening process is the Armed Forces Qualification Test (AFQT), which is a subsection of the Armed Services Vocational Aptitude Battery (ASVAB). This standardized assessment measures a candidate’s skills in the areas of paragraph comprehension, word knowledge, arithmetic reasoning, and mathematics knowledge. The AFQT can be administered in two ways. The first is paper and pencil administration. As the name implies, test-takers complete this version of the AFQT by reading test booklets and filling out answer sheets. 84 minutes is allotted to answer the 105 questions. There are different time limits for each of the four sections. Individuals can also complete a computer version of the test. This is an adaptive test, meaning the difficulty level of each question is determined based on whether the previous question was answered correctly or incorrectly. Aside from the fact that this version of the AFQT is a computer adaptive test, the number of questions that must be answered varies from the written version of the assessment. Individuals only need to answer a total of 59 questions. 89 minutes is allotted for the four sections of the Armed Forces Qualification Test, and test-takers typically have more than enough time to complete each section. How is the AFQT scored? Scores on the test can range from the first to the 99th percentile which means that the final score represents how well an individual performed compared to others who took the test. 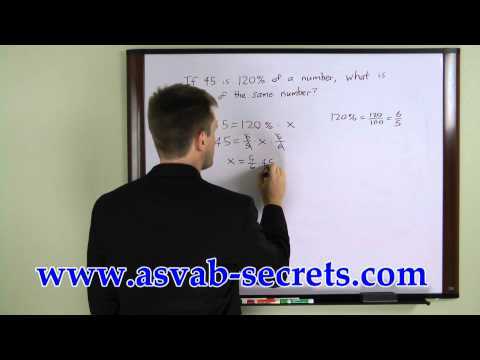 The score doesn’t necessarily represent the number of test items an individual answered correctly. 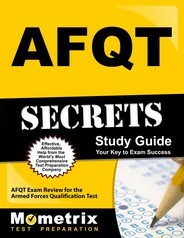 Ace the AFQT test using our AFQT exam study guide with practice questions. 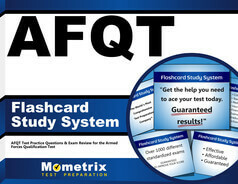 Quickly Solve Difficult AFQT Test Questions with the AFQT Flashcard Study System.